After sitting out the first round last year, the Minnesota Wild currently have the 24th overall pick in this month’s NHL draft. Minnesota has picked in the first round 17 times, beginning in 2000 with one-time Czech star Marian Gaborik. Most recently, the Wild selected University of Wisconsin forward Luke Kunin with the 15th pick in the 2016 draft. 2000 — The first draft of the new millennium was underwhelming: Goaltender Rick DiPietro went No. 1 overall, while the first round produced just five All-Stars. However, the first draft pick in Wild history was among 2000’s success stories. Gaborik remains the franchise scoring leader after potting 219 goals in a Wild sweater, a record that Koivu is only now approaching, nearly nine years to the day after Gaborik’s departure. 2001 — Koivu stayed in Finland for a few years, finally making his Wild debut in 2006. The Finnish import was worth the wait, becoming an alternate captain a few years later. He was named the Wild’s first permanent captain (the position had previously rotated regularly) in 2009, and has held the “C” ever since. Now 35, Koivu is the franchise leader in games played (925), points (659) and assists (466). 2002 — The Wild’s third consecutive top-10 pick never reached the high bar set by the first two. A speedy and creative playmaker, Bouchard had 50-plus points in three consecutive seasons from 2005-08. However, Bouchard also suffered from concussion issues, missing all but one game of the 2009-10 season. He played sporadically for three more seasons with the Wild, eventually signing in the Swiss league after stops in Chicago and New York. 2003 — Widely considered one of the most talented groups in NHL history, the class of 2003 was loaded. 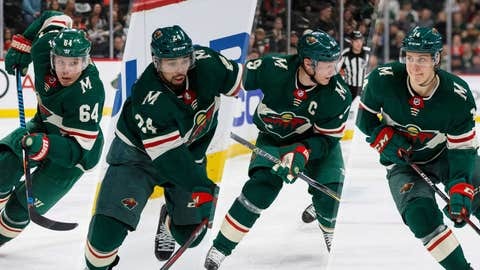 Every player selected in the first round would go on to appear in at least one NHL game, while 17 became All-Stars, including Burns and a who’s who of future Wild talent: Eric Staal, Zach Parise, Ryan Suter and Thomas Vanek. Drafted as a forward, Burns moved back to the blue line after the draft, where he developed into one of the Wild’s top defensemen. He was ultimately traded to the San Jose Sharks during the 2011 draft, landing forwards Charlie Coyle, Devin Setoguchi and a first-round pick. More on the latter in a moment. 2004 — Thelan went unsigned by the Wild after appearing in just one game for Minnesota’s AHL affiliate, eventually catching on in the ECHL. He retired in 2011. Wild goalie Devan Dubnyk was selected two picks later by the Edmonton Oilers. 2005 — The Wild used their highest pick since drafting Gaborik on Pouliot, who had posted back-to-back point-per-game seasons in the OHL. He was never able to replicate that success in the pros, appearing in just 65 games in four seasons with the Wild. 2006 — Minnesota selected Sheppard after missing out on future stars like Jonathan Toews, Nicklas Backstrom and Phil Kessel. Sheppard spent three seasons with the Wild, registering just 49 points in 224 games, before being traded to the Sharks. 2007 — Gillies appeared in just 89 games in three seasons for the Wild before he was claimed off waivers by the Columbus Blue Jackets in 2012. 2008 — This draft is remembered for star defensemen Drew Doughty, Alex Pietrangelo and Erik Karlsson. Unfortunately, the Wild had to settle for Cuma, who appeared in just one NHL game. Future Wild forward Tyler Ennis was selected three picks later by the Buffalo Sabres. 2009 — The Wild have a complex relationship with their 2009 pick. A Minnesota native, Leddy was traded to the Chicago Blackhawks less than a year after the draft, and would go on to help his new team to a Stanley Cup. The Wild received defensemen Cam Barker and Kim Johnsson in exchange, neither of whom made a significant impact in Minnesota. 2010 — Granlund spent two more seasons in Finland before joining the Wild, debuting in 2012. His effectiveness increased dramatically in his fifth season, when the Wild moved the crafty playmaker from center to the wing. He scored 26 goals and finished the season with a career-high 69 points, then registered 67 points the following season. 2011 — The Wild had two first-round picks thanks to the Burns trade. They landed a solid defenseman with the first. Brodin has developed into a top-four defender with the Wild, and routinely mans Minnesota’s second pairing behind Jared Spurgeon and Ryan Suter. The Wild’s second first-rounder was less successful. Phillips never appeared in a game for the Wild, spending two seasons with their AHL affiliate. He was eventually traded to the Boston Bruins. 2012 — Defensemen were selected with eight of the first 10 picks in 2012, and the Wild got in on the action. Dumba has been among the more successful members of that group. Now 23, Dumba leads all 2012 defenseman with 44 career goals. 2013 — The Wild dealt their first-round pick and other assets to the Sabres for forward Jason Pominville. The Sabres selected defenseman Nikita Zadorov, now of the Colorado Avalanche. 2014 — Tuch spent two seasons at Boston College before signing with the Wild. He made six appearances for the Wild during the 2016-17 season, spending much of the year in the AHL. The Wild dealt Tuch to the Vegas Golden Knights during the 2017 expansion draft. 2015 — Eriksson Ek made his way to North America in time for the 2016-17 season, appearing in 15 games for the Wild. He returned as a full-time NHLer the following year after a brief stint in the AHL, scoring six goals and adding 10 assists in 75 games. 2016 — A star for the Badgers, Kunin signed an amateur tryout contract and joined the Wild’s AHL affiliate for the tail end of the 2016-17 season. He made his NHL debut the following year, registering two goals and two assists in 19 games, but suffered a torn ACL on March 4. 2017 — The Wild traded their first-round pick to the Coyotes as part of a package that brought forwards Martin Hanzal and Ryan White to Minnesota at the 2017 trade deadline.